He loves a challenge...and she is an irresistible one. What will change her mischievous ways: prudence or passion? Ophelia Reid is an incomparable beauty and a ruthless gossip. Having purposely wrecked her arranged engagement to future marquis Duncan MacTavish, Ophelia wants to return to London's marriage mart and make her own choice of a wealthy husband. But on her journey home, something unexpected happens. . . . The heir to a dukedom, Raphael Locke is the most sought-after young lord in England. When MacTavish claims that Ophelia will never be anything but spiteful, Rafe bets his friend otherwise. Whisking her to his country estate, Rafe shows his furious, sharp-tongued "guest" the error of her ways and discovers the surprising reasons for her bad behavior. When Rafe champions the new and improved Ophelia's re-entry to London society, marriage proposals pour in. But has Rafe gone and fallen in love with Ophelia himself? I made a trip to the library, did a re-read on "The Heir" and then picked up where that book left off with Rafe and Ophelia in "The Devil Who Tamed Her." It took seven years for Rafe and Ophelia to get their story, but it was worth the wait. The story takes up at the same house party that Rafe and Ophelia met and to my way of thinking... basically stole the book from the main characters, Duncan and Sabrina. 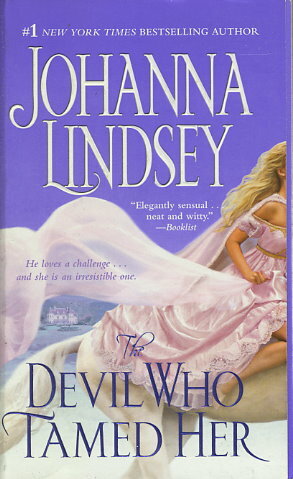 I found "The Devil Who Tamed Her" a splendid book with heart twisters all over... Ophelia's eighth birthday party is one. I read the last few chapters twice and cried both times. Didn't think there was a chance that Johanna Lindsey would be able to redeem Ophelia into a heroine that I would care for after her stunts in "The Heir" but I'm thrilled to be shown differently.